Converts M4V to MP4 or other 1,000+ video formats like MOV/AVI/MKV etc. Customize M4V videos with cropping, trimming, adding watermark, applying effects, etc. Download M4V videos from 10,000+ popular websites by pasting URL. Additional functions including GIF Maker, Screen Recorder, Fix Media Metadata, VR Converter, etc. It probably be hard for you to watch M4V file on Android phones, Windows PC, PSP, Xbox or edit the M4V video in iMovie, Final Cut Pro, since the M4V format which is used to store movies, TV series, and music videos in the iTunes Store can only be compatible with iTunes and QuickTime. To solve your problem, you can simply convert M4V to MP4 with the video converters recommended in the article. MP4 is the most popular video format supported by many players, video editing tools and game devices. Turn M4V to MP4 will enable you to get the most out of your M4V files. Wondershare UniConverter (originally Wondershare Video Converter Ultimate) is the most recommended M4V to MP4 converter for both Windows users and Mac users. It can convert M4V to MP4 or other 1,000+ video formats with video editing features and full quality conversion. 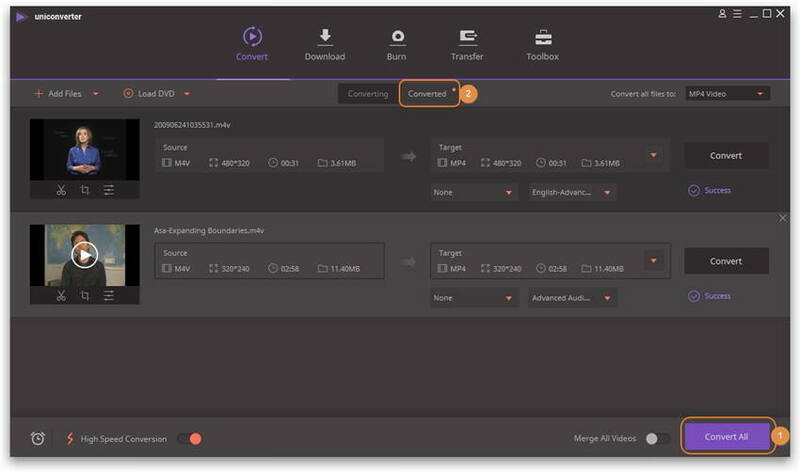 The Wondershare UniConverter (originally Wondershare Video Converter Ultimate) also has many additional functions like downloading media files by pasting URL, transfering files from PC/MAC to iPhone/iPad/Android devices, and more. 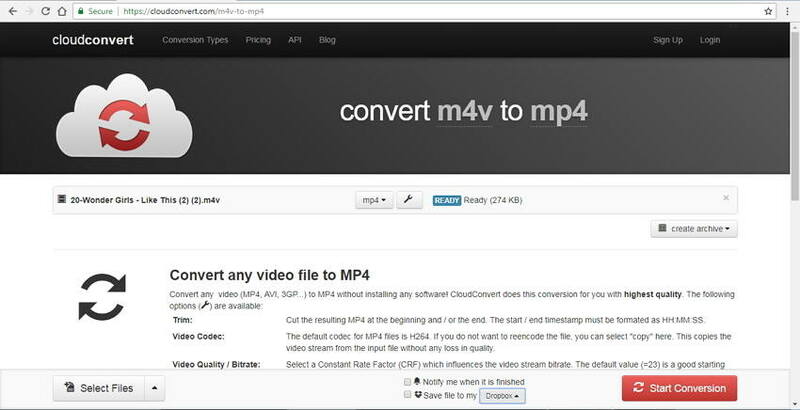 Follow the detailed steps below and convert M4V to MP4 easily. Convert purchased M4V movies to MP4 and other popular formats without transcoding. Download/record online videos from over 10,000 sites. The guide below will tell you how to convert M4V to MP4 for Windows (Windows 10 included). 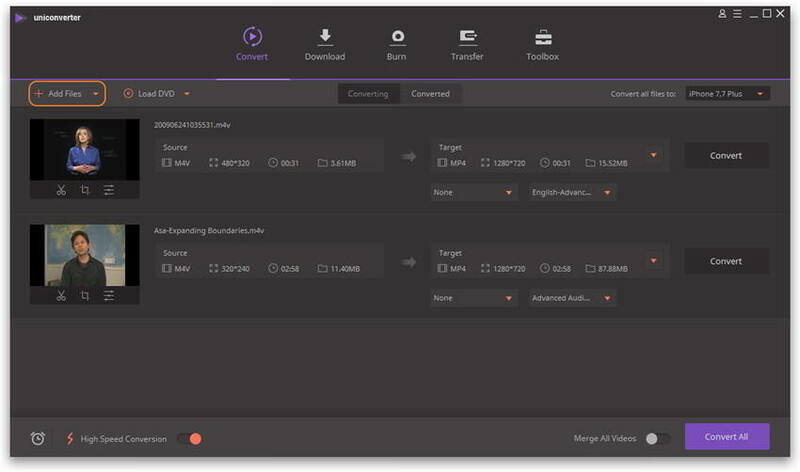 If you want to get an M4V to MP4 converter for Mac (Mojave included), just download Wondershare UniConverter for Mac (originally Wondershare Video Converter Ultimate for Mac) and read the operation instruction here. Step 1 Load M4V Files to the M4V to MP4 Video Converter. Click the drop down icon of Convert all files to: at the top right corner of the main interface to open the drop-down format list. Select MP4 from Video, and then click the format preset. If you want to set the parameters for audio or video for more enjoyable playback experience, just click Create Custom button to access the setting window. Bitrate, Frame rate, resolution, channel are freely adjustable. Step 3 Personalize Your Output Video (Optional). This Video Converter also provides easy editing feature to allow you touch up your output video instantly. Common editing functions are provided, including cropping, trimming, applying effects, adding watermark or subtitles. Bonus Feature: You can also use this M4V converter to convert M4V to DVD format by clicking the Burn tab on the top of the interface. And then click the Editing icon on the right pane to select your favorite menu template. In this way, you can create a professional DVD. Step 4 Convert M4V to MP4. When all settings are satisfied, just hit Convert All button to convert M4V to MP4. This program is quite efficient and you can find the converted videos in the Converted tab by right-clicking Open File Location from the down-down list. That's it! Now you can enjoy your M4V files anytime, anywhere. Great job! This software allows you to free convert M4V (DRM protected not supported) to MP4 in very short time. It assists you to convert to tons of video and audio formats free and easy, making them compatible with all devices with great quality. You can also make video customization with built-in video tools. However, like all free software, the output video quality is not so good compared with paid M4V converters, and the converting process may take longer time. Pro: Absolutely free video converter, easy to use. 1. The free version cannot convert to 3D and HD. It can only convert to common videos. 2. It doesn't have the "Convert To Preset" inbuilt. 3. The output video quality isn't that satisfactory. 4. You can't convert M4V to DVD with this free M4V to MP4 converter. You can use the free online video converter as well if you only have small M4V files to convert and don't hurry to get the files as the online conversion will take rather long time to finish the conversion. There are many online M4V to MP4 converters, we have picked the most popular and top-rated ones. This is one of the top rated online conversion tools that support an array of formats including M4V to MP4. The program has a simple interface to make it easy to use for the non-technical users as well. You can either add the file from your PC or can download it online at the interface directly. The converted file can be downloaded or can also be requested to send on your email id for safe keeping. Maximum of 250MB files can be added to the program for conversion. Step 1: Open Convert.files on your PC browser. Click Browse to add the local M4V file from your PC. You can also give an online link for downloading the same. Step 2: Choose MP4 under the Output format tab. Step 3: Check the box for sending the downloaded file on email if desired. Click the Convert button to start the conversion process. 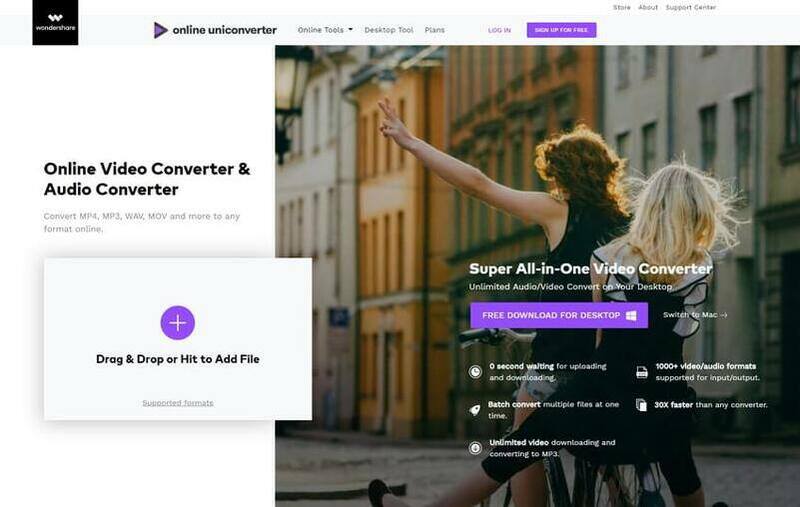 Another popular M4V to MP4 converter online is Online UniConverter (originally Media.io). This free and simple program allows adding an array of file formats that can be converted to a variety of audio and video formats. Maximum of 2 files at a time can be added for conversion. There is no need for any download or installation as the tool works directly from your Windows or Mac system. Step 1: Open Online UniConverter (originally Media.io) on your PC/Mac. Click +Add your files. Browse and import M4V videos from your system. Step 2: At the "Convert to:" tab, choose MP4 from the Video list. This is a feature-packed tool to convert M4V to MP4 online free. Over 200 formats are supported by the program for conversion. There is support for editing the audio and video codecs, video aspect ratio, resolution and other parameters. You can also trim the unwanted parts of the video using the tool. Batch processing and folder monitoring are the additional features. The conversion speed is good with decent quality output files. Files for conversion can be added from PC, URL, Dropbox, Google Drive, and OneDrive. Step 1: Launch Cloud Convert on your PC browser. Click Select Files to import M4V videos to be converted. Step 2: Click the edit icon for making any changes to the video parameters if needed. Step 3: If needed, you can save the converted file to cloud storage. Click the Start Conversion button, to begin with, the M4V to MP4 conversion process. There is no doubt that online M4V to MP4 converter is pocket-friendly and easy to use, but these programs have a number of limitations and cannot compete with the quality and features offered by the professional conversion tools. Online tools have a limitation to the maximum file size that can be added for conversion at a time. The online programs are basic converters without any additional features and functions like editing, batch conversion, and others. The quality of output files using online conversion is quite basic. Online tools are completely dependent on the internet connection for their working and conversion speed. VLC is one of the most popularly used media players that supports all types of platforms and OS. This open source and the flexible player supports a wide range of video formats playback and in addition to this, it also works as a decent video conversion tool. So if you want basic M4V to MP4 conversion without using any third party software, VLC Media Player is a good choice. 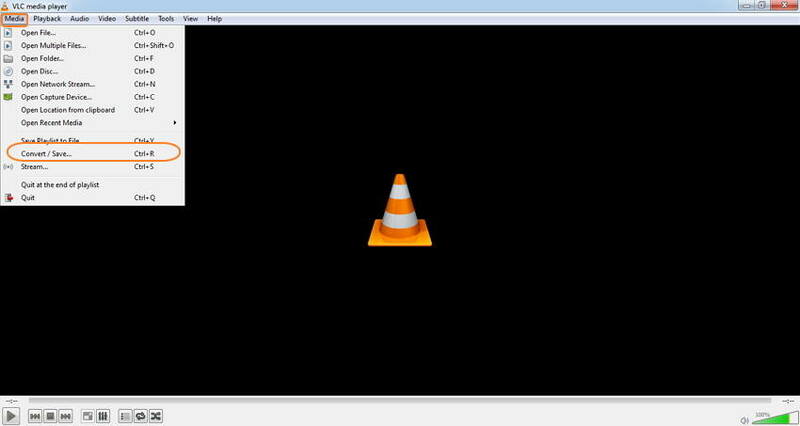 Step 1: Launch VLC Media Player app on your PC. Open drop-down menu at the Media tab and choose Convert/Save. Step 2: Choose the File tab and click Add to import M4V videos that you want to convert from your PC. Step 3: Click the Convert/Save button at the bottom right corner. A new Convert window will open. Under Settings, choose MP4 from the Profile list as desired output format. To change video codec and other file parameters, click the edit icon next to output format. Under Destination, click Browse and choose location and file name on PC where you want to save the converted file. Step 4: Click Start to begin M4V to MP4 conversion process. Does not support batch processing for converting multiple files at a time. The number of supported output formats is limited as compared to professional tools. The conversion speed is not very fast. 1. Question: Can I just rename the file extension from M4V to MP4? It may work sometimes, but it's really risky. the original file structure maybe broken, and you won't get the exact video quality you had before. 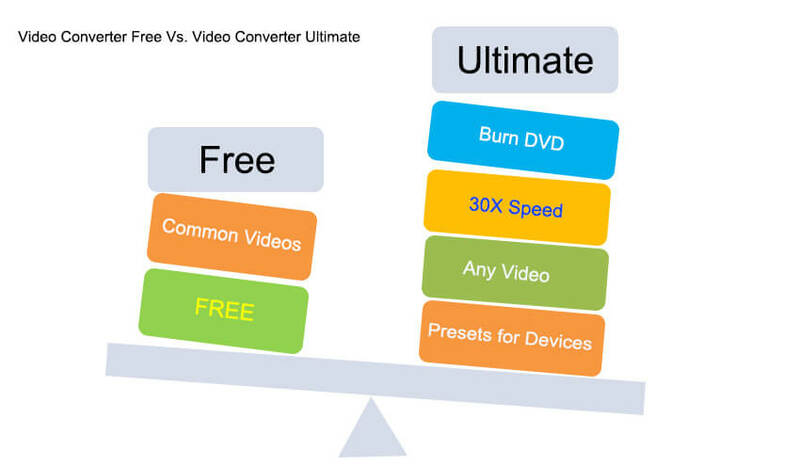 So, you need to use a solid video converter to convert files with high quality output and ultrafast speed. 2. Question: Why convert M4V to MP4, any more information? 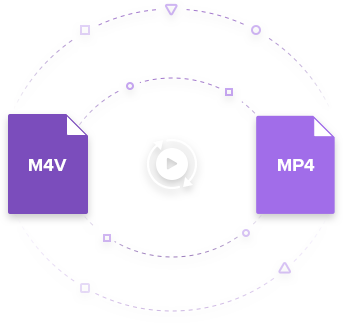 M4V is MPEG-4 file extension used for videos downloaded or bought from the Apple iTunes store, including movies, TV shows or music videos. It's similar to a MP4 file, but may be copy-protected using Apple's FairPlay DRM copyright protection. For items downloaded from iTunes, you can also play them with QuickTime or VLC besides Apple products, like iPhone, iPod, iPad, etc., but for items purchased from iTunes, you can only play them in iTunes or iOS devices thanks to the DRM authorization. MP4 is the official filename extension for MPEG-4 Part 14. 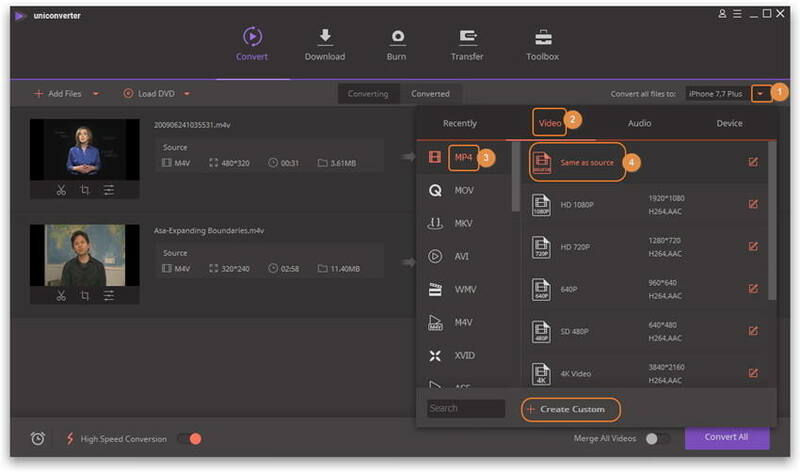 It's most commonly used to store digital video and digital audio streams, especially those defined by MPEG, but can also be used to store other data such as subtitles and still images. It can be supported by a variety of digital players, like iPod, iPhone, PSP, Archoes, Xbox, iRiver, Zune, video editing tools like iMovie, Final Cut Pro, Adobe Premiere Pro, mobile phones like Android, Blackberry, HTC, etc. 3. Question: Can I use Handbrake to free convert M4V to MP4? Handbrake can't remove DRM as is noted on its page, so converting DRM protected M4V to MP4 will be impossible. You can try UniConverter (originally Wondershare Video Converter Ultimate). Want to get the best video output quality for your M4V video? Just try UniConverter (originally Wondershare Video Converter Ultimate) below.